Is Psalm 83 merely an imprecatory prayer? Dr. Reagan: Bill, let's jump into the criticisms that have been made concerning your theory of Psalm 83 being the next Middle East war. One such criticism is that Psalm 83 is simply what's called an imprecatory prayer. That's a prayer calling on the defeat upon the enemies of Israel. Critics will say that Psalm 83 is simply a lament, and that it's nothing more, and it has nothing to do with prophecy. It is not a prophecy they believe. Bill Salus: I think in part Psalm 83 is indeed an imprecatory prayer. It is an invocation to curse those that would curse Israel. But, we also find out that Asaph who wrote this prayer is a prophet. Dr. Reagan: Most people don't know that. They think of him as the worship leader of David, but not as a prophet. Bill Salus: Well, Hezekiah realized he was a prophet in 2 Chronicles 29:30, when he commanded the Levites to sing praises that were written by David and Asaph the Seer. The Hebrew word for seer is chozah, meaning "beholder of vision, a prophet." Asaph wrote 12 Psalms including Psalm 73, Psalm 83, and also Psalm 50. Psalm 83 is the most prophetic of all of them as a seer. So clearly, Asaph according to the Bible was a prophet just like Jeremiah and Isaiah. The other reason I think Psalm 83 is quite clearly not simply an imprecatory prayer is because there's very specific details in this prophecy. There's a confederacy that forms a plan and comes together with the goal to destroy Israel so that the name of Israel would be remembered anymore. We are told that this confederacy wants to take the pastures of God for their self-possession. They want the land. They want the Promised Land and to destroy the Chosen People. When you start looking at what that confederacy wants, such a contemporary confederacy exists today that has come together with the same plan as Psalm 83 describes. Psalm 83 is not a chronological ordering of Israel's ancient enemies, which some people try to suggest that it is. Asaph lists ten enemies, but Israel had many more enemies besides these guys. Listed in the confederacy are habitation conditions, like in other words, we have the tents of Edom, meaning refugees probably like the Palestinian refugees. It says that Syria helps the children of Lot with a strong shoulder of support. So, in other words, we have listed a bona fide confederacy where one of the members actually needs help. Nobody can just chronologically say this is just a bunch of Israel's ancient enemies found in an imprecatory prayer. There are modern day equivalents. Nathan Jones: What's the contemporary names of these nations for folks who are not familiar with the geography around Israel. You keep speaking about contemporary enemies and that the Psalm 83 war is going to be between Israel and its surrounding nations. But, what are those surrounding nations? Bill Salus: From Israel, let's go north, off to the west, and then down to the south. You've got Hezbollah as the inhabitants of Tyre, which is modern day Lebanon. There one would find where the Hezbollah are. Then you go northeast to Syria. Iraq would be part of that, too. There is Jordan and Saudi Arabia. There are the Palestinian refugees and Hamas in Gaza south of Israel. I believe Egypt will be involved along with the Muslim Brotherhood as well. These are the countries that share common borders and have terrorist populations within them that have been Israel's most observable enemies since 1948. Ever since ancient times, these peoples have harbored a hatred of Israel all throughout their existence. I believe that war is coming to a conclusion probably very soon. I think that Psalm 83 is a prophecy for our time. Dr. Reagan: Some people actually take the position that the Psalms are just not prophetic in nature. They say they're only poetry, and that they are merely inspirational. But, the Psalms are full of prophecies about the First Coming of Jesus. They're also full of prophecies about the Second Coming of Jesus. So, I would strongly argue that the Psalms are also prophetic in nature. Bill Salus: I would agree with you. Psalm 2 I believe is prophetic, and one of the greatest Psalms in the Bible about the Second Coming. Psalm 22, obviously a messianic prophecy. Psalm 60:8 talks about Moab will be a wash pot, and Edom will be where the Lord casts His shoe. There are quite a few. One of the arguments that is important to people who say the Psalms aren't prophetic is they'll declare, "You have to look to the major and minor prophets, for they would have had to write about Psalm 83, too, to make it a legitimate prophecy." I point out in my book that I believe there are 150 related verses, even more than Ezekiel 38 & 39, dealing with Psalm 83. Dr. Reagan: Yes, I thought that was one of the strongest points you made in your book. 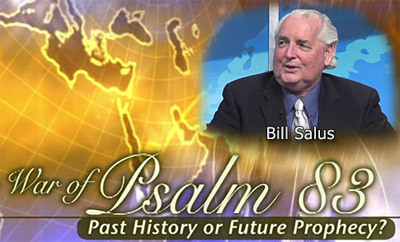 In the third and last segment on the War of Psalm 83 with Bill Salus, he'll fend off some further criticisms against Psalm 83 being a prophetic event. With the court's ruling on gay marriage...it wasn't a surprise considering their other recent rulings. All I can say is I've controlled my anger by knowing the full wrath of God will be upon Obama and the homosexuals. Let vengence be His. I am holding my breath because I fear what catastrophe may happen cause so many innocent suffer too cause we are still here as a church. I pray God will have mercy and either take us out in rapture or spare those who are only living in this time. I'm sorry, but I'm not convinced by Salus' conclusion. He has not provided enough evidence that Psalm 83 is more than imprecatory. There is no mention of Psalm 83 anywhere else in the Bible and this creates a major problem for Salus' theory.